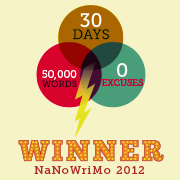 Yesterday I finished writing my 50,000 word book as part of the NaNoWriMo writing challenge. This year, instead of writing a novel in 30 days, I worked on a non-fiction book. It's a collection of essays on different subjects. Here are some of the lessons I learned from this year's writing experience. First of all, I now know I can do it, and it doesn't feel like such a great effort to achieve this goal compared with the first time I did it in 2010. Second, I found, as expected, that writing essays is easier for me than writing fiction. Perhaps I am more of an essayist than a fiction writer. I have always found it quite easy to write about any given subject that interested me. At school I think I received the highest marks for Hebrew Composition, and while others struggled to find things to write, I found it easy to structure an essay and write it out. I suppose writing non-fiction is part of my work as a translator, though there I have to write what the text said in the original language rather than make it up from scratch. My blog has also allowed me to practice this sort of writing. There are important differences between writing fiction and writing non-fiction, and also between having a long-form and short-form structure. In a novel, you have to plan where the story goes and build a narrative that develops throughout the work. In my collection of essays, they were all linked and built on each other to some extent, but it wasn't a linear development. I know that some non-fiction books manage to be structured in a more linear way, with each chapter or section building on previous chapters, but this wasn't that sort of book. Perhaps it will become more linear during the editing process. Fiction is very specific. It tells the story of events happening to and around specific characters, in a specific setting, over a set period. My non-fiction was trying to be general. What I wrote is supposed to be applicable to the reader's life, and so it couldn't be as specific as fiction. It had to address a wide range of possibilities. I understand that this is something I do in my own thinking: I try to generalize from specific experiences and events. Readers of this blog may recall blog posts like that, where I start with something specific and end up reaching some more general conclusions. Because I had decided in advance on a list of topics for the book, and knew it would undergo extensive editing after I had written all the essays, this freed me from the need to think about the book as a whole while I was writing it. I knew that the editing process would allow me to put things in the right order, make the necessary connections, and get rid of any repetitive parts. As I have noted before, the editing process seems more daunting to me than writing, and this is why I know that it's time for me to work harder on this part of the writing profession. I will have to edit this book, and also the first novel I wrote during NaNoWriMo in 2010. I hope to learn a lot from the editing process, and also to learn how to plan and outline books before I start writing. I didn't manage to write every day during November, and sometimes I had to write two or three times the daily average word count to make up for days I had missed (and I still managed to finish the day before the deadline!). Finding that I could write nearly 5,000 words in one day when I had to proved to me that I can do it, and I intend to keep writing, even when I don't have a writing challenge and can be more flexible with my daily word count.